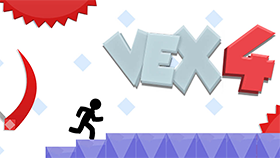 Vex 3 is an interesting platform game that was created by Amazing Adam games and released in August 2014. This game is the third installment of series Vex game. Its prequels are Vex and Vex 2, and its sequel is Vex 4. In this game, you’ll continue to play as the black stickman as you traverse through even more different terrain and overcome newer challenges that are in your way. With simple recreation gameplay but full of real challenges, the Vex series in general and the game Vex 3 in particular, are so attractive with players who are looking for something simple but really challenge. It can say that this game is very successful. The evidence is that it is so popular and played by millions of players from around the world. And their feedback is also very positive. Besides that, until this time, its developer has launched a mobile version for both Android and iOS devices. All of them are well received. Similar to its previous installments, in this game, players continue to control the black stickman and overcome various extremely difficult terrains that full of deadly traps. There are a total of 10 acts in this game and of course, each of them is also full of obstacles and traps. However, if you have played two previous games, surely you will surprise with this game because it's even harder. Besides that, depending on the time to complete an act, this game will rank players with 3 different degrees including Gold, Silver, and Bronze. The fact that challenges here are now much harder as right when you begin the game at stage 1, you’ll already have to overcome quite the challenge due to the game’s complex terrain, and after you finish stage 1, you’ll have to return to the beginning of the level so that you can get to stage 2 which has an even more complex terrain. This repeats for every stage afterward. In addition to tons of deadly traps and difficult terrain, this game also features with time count that shows players the time they spend to complete an act. This feature makes the game become more attractive because every people want to challenge themselves by trying to complete the game as quick as possible. Different from its previous installments, this game replaces the Achievement system with Trophies. In here there are 4 main sections: Acts, Hardcode, Awesome stuff and Completion with 39 goals for you to achieve. In Acts section, there are total 10 acts. In order to receive trophies, you need to complete these acts to any ranking. Hardcode: Players will receive trophies in this category if they can complete the challenge acts and find hidden stars. There are a total of 19 trophies in Hardcode section. Awesome stuff: Trophies in this sections are for players who can perform hard and tricky feats. There are 6 trophies in this section and it’s quite hard to receive them. Completion: There are four trophies in this section and they are very difficult to get. Use arrow keys or WASD to move the black stickman. Jump from side to side to climb up the walls. Press the down arrow key when standing on the acting block to play new acts. There are more instructions for each obstacle in this game. Do follow the instruction to beat the challenge. The purple blocks are very weak and they will fall down if you stand on them. The orange blocks will help you to bounce as a bouncing ball. If it is the first time you encounter a challenge, let’s stand still and use your mouse to drag and see more scenes, traps, and etc before jumping high or moving. There are lots of traps in this game, so, always be careful. When you get stuck at any challenges, let’s watch our walkthrough video below. We have created a full and detail video to guide you overcome all the challenges in this game. So, it can help you much. In case your game is so laggy, let's clear your cache. This action may help to boost your game speed. In my personal opinion, I totally agree with Guest Blogger. Playing a challenging game with an interesting friend as well is something brilliant in our life. However, I bet that sometime you get trouble with accessing this game at school or workplace. Don't worry! Here we offer you a special version - Vex 3 unblocked at school. With this version, you can enjoy the game anytime and anywhere you want. So, don't hesitate anything! If you want to relax, jump into the game world and conquer all challenges in it. If you want to enjoy this game with your friend, call him/her and enjoy together! Hope that you will have lots of exciting moments when playing games at Freegames66.